Clint Bowyer No. 07 is made from a light blue material with black button eyes and a larger black button nose. He has a black ribbon with the NASCAR logo on it tied around his neck. On his chest is the DIRECTV logo embroidered in blue. On his back is embroidered “BOWYER 07” and Clint Bowyer’s signature underneath. Clint Bowyer No. 07 was released on 29th June 2007. He is named after the NASCAR driver, Clint Bowyer. His birthday is on 30th May 1979, which is the real Clint Bowyer’s birthdate. 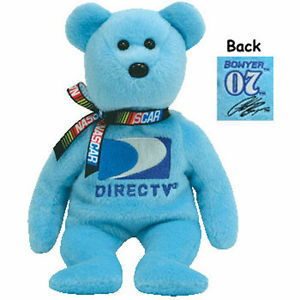 There are 27 licensed NASCAR Beanie Baby bears, each with an extra swing tag with a holographic NASCAR logo on it.